Banner for the Al Nusrah Front, a jihadist group in Syria. Image from the SITE Intelligence Group. The Al Nusrah Front for the People of the Levant, an al Qaeda-linked jihadist group in Syria, has claimed credit for numerous attacks, including four suicide bombings, against Syrian security forces, government officials, and a government-backed militia. The Al Nusrah Front claimed credit for the attacks in 12 statements that were released by the Al Manara al Baydha’ Foundation for Media Production on jihadist web forums on June 30. The statements were translated by the SITE Intelligence Group. The “soldiers of the Front” conducted scores of attacks throughout Syria, including in the cities of Damascus, Aleppo, Dier al Zor, and Idlib. The targets have included members of the government, police, military, intelligence, and the “shabiha” or the ghosts, President Bashir al Assad’s plain-clothed militia who have massacred thousands of Syrian civilians in brutal attacks. Also targeted were pro-government tribal leaders. 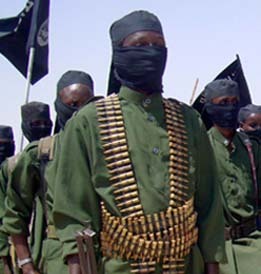 The attacks consisted of suicide bombings, ambushes, assassinations, car bombings, and IED attacks. The first suicide attack took place on June 7 in the Al Maysar neighborhood in Aleppo. Al Nusrah said the “martyrdom-seeking operation” struck a bus carrying “elements of the state security of the tyrannical oppressive regime who are called the ‘Brigade of Preserving Order. '” The suicide bomber detonated his vest on the bus, and “caused large damage in the soldiers of the tyrants.” Al Nusrah claimed that a “Captain from the Al-Sha’aar police section” was among those killed. “We hope this operation will be followed by larger and more powerful and more effective operations,” Al Nusrah said. In another suicide attack, which was not dated, a suicide bomber identified as Abu Nawras al-Janubi detonated his car bomb against the “Hirak barrier in Daraa.” Al Nusrah did not provide details of the result of the operation, but promised more suicide attacks. “The battle has intensified and there will be tens of the like of the hero Abu Nawras until Darra of heroism is liberated from the Nusayri enemy,” the statement said, referring to the Shia sect that makes up much of Syria’s leadership. In the third suicide attack, which also was not dated, Al Nusrah said that a suicide bomber named Al Laith al Furati detonated a car packed with explosives into a military security headquarters in Al Salihiyah, near Deir al Zor. “So, he took a car full of explosives, went through the barriers, reached the headquarters and blew up the building, leaving it to collapse and filling the hearts of the dogs of this regime and its elements with horror of the moment that hides for each of them to make them taste from the cup of their demise,” the statement said. In the last suicide attack claimed by Al Nusrah, which took place on June 14, the terror group said Abu Mu’awiyya al Dimishqi drove a van laden with explosives into “a state security branch in the neighborhood of al-Sayyida Zaynab in the countryside of Damascus.” Al Nusrah claimed that “many” security personnel were killed. Additionally, Al Nusrah claimed credit for the June 7 assault on the Al Ikhbariya television station in Damascus that killed seven people. The terror group accused the TV channel of being an arm of the government. 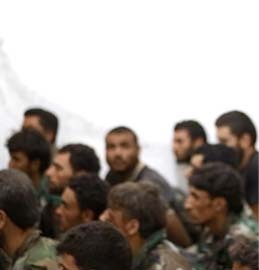 “This media is part of the murderous soldiers of the regime and the shabiha [thugs]. The Syrian al-Ikhbariya channel is one of the striking arms of the regime, for it lied and fabricated often, and in criminality it was creative,” Al Nusrah said. 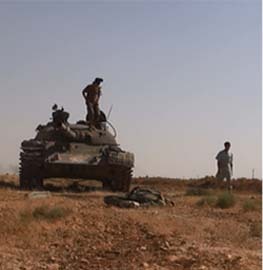 President Bashir al Assad’s regime has been battling the Free Syrian Army in several of the country’s major cities. Assad’s security forces have ruthlessly attempted to suppress the rebellion. Over the past year, Syrian government forces have killed more than 17,000 Syrians, indiscriminately shelling civilian areas and using armored vehicles and snipers to fire on civilians. Additionally, the “ghosts” have been waging a violent campaign against civilians, including massacres in small towns throughout Syria. The Syrian resistance has denied that jihadists are operating in its midst, and instead has maintained that the suicide bombings have been carried out by Syrian intelligence services as part of a false flag operation. The Al Nusrah Front announced the formation of the “Free Ones of the Levant Brigades” in a YouTube video statement that was released on Jan. 23. In the statement, the group claimed an attack on security headquarters in Idlib. 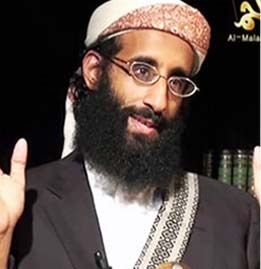 Al Nusrah has identified its leader as Sheikh Abu Muhammad al Julani. Since announcing its formation, Al Nusrah has claimed credit for at least nine suicide attacks, and scores of attacks on Syrian security forces and government officials. In addition to the Al Nusrah Front, a second jihadist group has recently been activated in Homs. In February, a group calling itself the Al Baraa Ibn Malik Martyrdom Brigade said it had formed a martyrdom battalion and was prepared to carry out suicide attacks against Syrian forces. 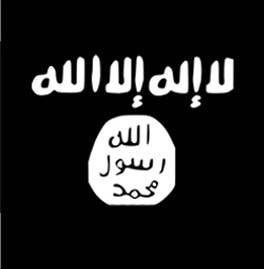 The video announcing the group’s activation showed members of the group posing in front of a flag belonging to al Qaeda in Iraq. Interestingly, a group known as the Al Baraa Ibn Malik Martyrdom Brigade was created to wage jihad in Iraq in 2005, and merged with al Qaeda in Iraq under the command of Ayman al Zawahiri. The newly activated group in Homs also said it was part of the Free Syrian Army. 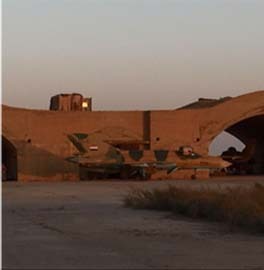 Al Qaeda in Iraq already has a strong presence in Syria [see LWJ report, Eastern Syria becoming a new al Qaeda haven]. The Abdullah Azzam Brigades, a regional al Qaeda affiliate, also is known to operate in Syria. Two of its senior leaders, Saudi citizens Saleh al Qarawi and Suleiman Hamad Al Hablain, have been added to the US’s list of Specially Designated Global Terrorists since November 2011. The terror group has denied any involvement in a Dec. 23, 2011 suicide attack in Syria. These guys are really just playing into Assad’s hands. The only reason that the regime has any support left is the spectre of Iraq’s insurgency and the brutalities committed by these same psychopaths there. Al Nusrah is a direct result of the Arab Spring. They are the inevitable result of it, one of these new terror groups that we knew would eventually pop up and start committing acts of terror. What I still can’t figure out is why some westerners were so naive from the start of the Arab Spring? It’s almost like our media’s talking heads just could NOT accept the slightest possibility that more terrorism could emerge from this so called “democratic uprising”…. Bill is part of a growing trend of observers and commentators that rightly note that Al Qaeda and it’s affiliates have not been affected negatively by this whole mess. Rather, they seem to have gained traction and strength and fighters and weapons and like I myself mentioned before, forget AfPak becoming a terrorist haven. AQ now has vast swathes of the Arab World with which to hide in. And they seem to have a lot of supporters as well. Let’s just face it, Jihadists have taken advantage of our naivety about the Arab Spring and they have successfully prolonged their own survival for the foreseeable future. This is pretty cool. Chaos from the Tigris to the shores of the eastern Mediterranean. Agreed. Unfortunately these attacks are feeding the Assad propaganda and ensuring the minority Christians and Shia/Alawi will cling to the murderous regime (as long as it murders OTHER people). These groups and instability they bring ARE an outgrowth of the Arab Spring, but largely in the short-term. Many of the post-revolution states are experiencing considerable violence and instability, but if you look long-term, AQ loses in this new balance. Some extremists will fight democracy as haram, but they will lose their recruiting pool as people acclimatize to expression and accountable government. The MB and others will be forced to moderate for more votes and will compromise as a matter of survival. This will be a strategic shift in the ME, perhaps similar to East Europe after 1989. But, say it isn’t the case, what could the West have done to stop the Spring? In Libya, we would have been complicit in massacre, Egypt would have likely overthrown Mubarak anyway, and Syria would be exactly where it is now: blood-stained streets. How do you know that though? As of right now, that’s not the case. Sure, it’s still early in the game, but as of right now Jihadists have not been weakened from the Arab Spring one molecule. In fact, they have been made much stronger from it. The theory that they would become sidelined because of democracy was a pipe dream at best, it was a mistake to believe that our system could automatically apply to that part of the world. I wonder if in 10 years, the AQ training camps in Derna are still there, or if bearded men are still bulldozing shrines in Libya, or if Northern Mali is still a Jihadist stronghold, or if the Sinai is still a Jihadist stronghold, or if there are still Salafists attacking secularists and setting police stations on fire, etc, etc, etc. When I criticize the Arab Spring, I mainly do it to make fun of the people who came out when it happened and believed that everything would be fine immediately and that there would be NO Jihadist elements to it and everything would be just kumbaya, peaceful and great. Those people were incredibly naive and recent events have proven them wrong. Now, we have to act based on the situations on the ground. Covering our eyes and ears and pretending that the situations on the ground are something other than what they are will open the floodgates to another 9/11. I appreciate the concerns you have, and I realize the difficulty in trusting what seems like an untested theory. But our best evidence and research points to most extremist groups losing when the general population has more say in governance. Sure, the instability allows them space, but once the dust settles, nearly all people would opt for a vote. And note I am not saying Jeffersonian democracy will spring up from these movements. And here’s the point: it isn’t about making sure no terrorists exist or all join the fold. There will ALWAYS be people violently opposed to mainstream politics, especially to democracy in Muslim countries. The point is to sap their recruitment pool of new blood and deny them the ability to ‘swim’ in the population. If young men have jobs and a future, blowing themselves up becomes less attractive. Combined with democratic peace theory, the absence of the kinds of external boogeymen will likely mean less instability long-term. The Salafis arent leaving anytime soon. That isn’t what this is about. It’s about letting them die of starvation and good CT efforts. I know the kinds of people you’re talking about; the perpetual optimists that routinely overestimate humanity’s humanity. I believe as I do while acknowledging that some bad stuff will likely occur before these fledgling govts can stand up. And I agree we must use our power to push these events towards our interests, but we have a bad habit of subborning democracy based on bad analysis, and it has at times made us less safe. Let’s give it a chance. Not only is it an untested theory, the exact opposite of what was predicted has happened. So the people who predicted only positive things now don’t even have a leg to stand on. And when exactly will that be? When will the dust really settle? In the minds of international Jihadists, that will not be until Israel is destroyed and the west has pulled out of the area and submitted to their religious dominance. These very same groups now have more land with which to operate in. In their minds, “the dust settles” when their enemies are utterly destroyed, and the rest fall in line with their view of the world. I’m not sure about you but I’m not going to do that. Of course you’re not saying that, because you’d look just as silly as all the others who came out in full support of the Arab Spring, thinking the Muslims would become just like us overnight, and everything would full of peace and democracy immediately. And now their untested views have been dashed by armed groups that have popped up as a result of the Arab Spring. It’s not exactly true that young men who have jobs and opportunity will not join extremist movements. How many people from rich Gulf countries went to join the Jihad in Iraq? How many became suicide bombers? Quite a few. Likewise, the 7/7 bombings were done by educated Muslim doctors living in a democracy. The Khost bombing was done by a Jordanian doctor. Foreign fighters in Afghanistan also are not all uneducated. As for letting Salafis die, as long as they have large swathes of the Arab World to recruit in, they will not. Whole new arenas have opened up for them and believe me they will take advantage of it. Take that along with the Internet, where Salafis have quite an unchallenged presence from which to influence and even recruit whoever believes in their cause. As I’ve said before, giving it another chance could open the floodgates to another 9/11 or worse. I do feel like a broken record now. But giving it another chance is something we cannot really afford at this point, lest we let our guard down for a while and get bitten by the snakes. You see, right now, the optimists (and people like you who say give it a chance), only have an immaterial concept of hope on your side. I, however, have concrete material evidence that states that democracy and freedom has not risen out of the ashes of this movement. Subborning democracy? So the people who warn about surface to air missiles ending up in Somalia, that’s subborning? Or people who are concerned because Libyan rebels desecrate the war graves of WWII British soldiers, and dig up dead bodies of saints, and attack western diplomats, and lynched government supporters, that’s a bad analysis? Well, say what you will, but I believe that’s more of a realistic analysis if anything. I could go on and on with my examples, but I’m sure Bill is getting tired of seeing me say the same things over and over again. I never tire of seeing you make a reasonable, sane argument, particularly when I agree with you 100%, as I do with the above comments.